When we sit at our tables every day, developing strategies, writing reports, and completing many other management and programming procedures, we rarely realize what matters most in all the things we do. How does the child feel about all we do? What matters most to them? A group in the Lufwanyama communities. This year we had our first Country Office review here in Zambia. The staff on my team were all very anxious, especially since the review team was comprised of very high powered Save the Children officials. Everyone wanted to prove and show that they were doing the right thing and following the guidelines. 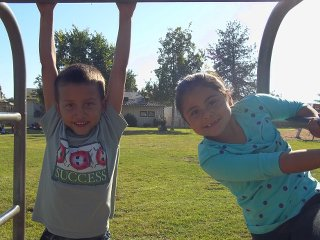 On the other hand, I realized children did not really care about what everyone thought but wanted to have fun and enjoy their school and outside sessions as usual. So it was after two days of meetings that it was time to meet the communities and children we are working with. Our group began the long drive to the Lufwanyama communities, winding and bumping along difficult roads. After hours of driving we met with core group members, teachers, and center care givers. Yet the most fascinating and humbling of the people waiting were the small beautiful faces of children. 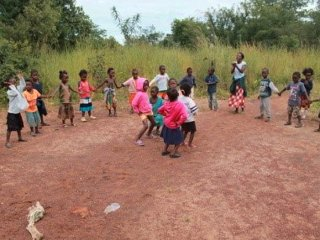 After exchanging greetings, the children quickly forgot the strangers in their midst and went back to their usual sessions. They sang songs, danced, and spent time with their teachers. When parents and teachers were asked about the impact of sponsorship programs, one parent proudly said “My child now teaches us hygiene as she learns from school which she never did before now.” Another proudly spoke about how the parents were working together to ensure that they built a permanent shelter for their children to learn in. Dancing in the Lufwanyama communities. But what do you think the children said, on what they loved most and what more they wanted? “I like it when the teacher teaches me how to dance and sing”, or, “I like playing with my friends at school”. While you and I are thinking of big, expensive, visible, and tangible physical development, that is not what matters most for the children we serve. For the child, what we may think is very small matters most to them. All the way back to the office I could hear everyone talking about their favorite child’s song, or how they all enjoyed dancing with the children, and how we all remembered our own childhood. Even the CEO could not help but sit and be swamped with the many children who wanted to just sit with him. Those are the little things that really matter, to put back the smile on that child’s face. Learning must be fun. Our role is to make it so. In one of the southern parts of the Philippines where Save the Children works, you will find the colorful tribe of the T’bolis. Upon visiting their community, you will notice the assortment of distinctive and colorful clothing against the green backdrop of the hills. The native clothes of the tribe, made of T’nalak, make the brown complexion of the people shine. A group of young girls wearing their T'nalak to school. The T'nalak cloth comes from the leaves of abaca, dyed and meticulously weaved. The intricate interlacing of bold colors is a recognized community craft. The cloth is revered and can be seen in special ceremonies throughout a person’s life span, such as child births and weddings. The typical T'boli textile is history in itself. The unique patterns of the costumes are born from deep-rooted rituals that are passed from generation to generation. The weaving is a tedious job and would take women several months to finish one complete design. The patterns conceived by the weavers are believed to be imparted to them in dreams from their ancestors and from the spirit of the abaca called Fu Dalu. Because of this, the T’nalak makers are also known as the “dream weavers”. Only women are allowed to lace the T’nalak. Men are forbidden to handle the abaca fiber until the weaving process is complete. There is also a saying that the weaver should not couple with her husband during the weaving time because it may cause the abaca to break or destroy the design sent across a dream. 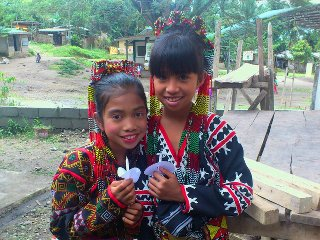 Two young girls from lake Sebu are encouraged to wear their traditional costumes at lea. T’boli communities observe the T'nalak festival annually in July, during the foundation anniversary of their province of South Cotabato. 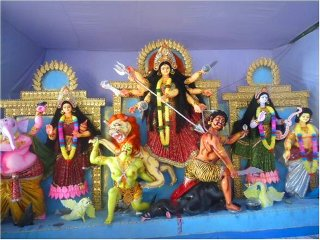 During this festivity, colorful street dancing can be seen throughout the cities with performers decked in native costumes of the various tribal groups. 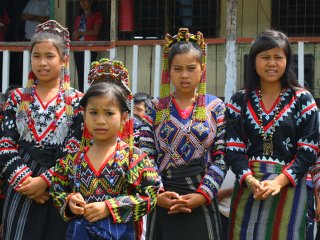 As a people who value rich cultural heritage, T’boli women and men learn to adorn themselves with their native costumes from early childhood. Aside from their wonderful T’nalak outfits, men wear turbans and women are garlanded with hair accessories, combs, and colorful beads. 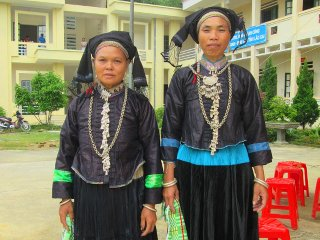 In their very simple lifestyle, these traditional adornments markedly stand out and are a source of community pride. My name is Fransheska Quijada and I grew up in El Salvador, a country located in the middle of Central America. I went to the U.S. in August of 2012 to obtain my Masters in Public Policy at the University of Kentucky (UK). I wanted a graduate program that included field practice because I wanted to prepare myself to become a specialist in the planning, execution, and management of public education and community development initiatives. It was through my Master’s internship program that I had the opportunity to join the Head Start team at Save the Children the following year. Through my internship with Save the Children, I had the chance to work with a dynamic, multidisciplinary, and passionate group of people. At the end of the day their mission is, “To inspire breakthroughs in the way the world treats children and to achieve immediate and lasting change in their lives”. Everyone involved with the U.S. sponsorship team, from the Director in Lexington, KY to the sponsorship liaisons operating in schools nation-wide, is committed to enhancing children’s lives in the present and creating a brighter future for them in the years to come. Hearing the sponsorship team talk about sponsors with such reverence and appreciation truly helped me understand that it is the sponsors who are indeed the driving force of bringing positive change to the lives of the children we work with. Without them, Save the Children’s reach would not be nearly as vast or impactful as it is today. I still recall when Amanda Kohn, Director of U.S. Programs Sponsorship, came to UK and spoke to us about Save the Children’s work. I could feel the passion and commitment that she felt for her job. Amanda spoke about her team, coworkers, their work environment, and the high level of commitment that all of them have. It was in that moment I knew that I wanted to work for such an organization. A few short months later, I was the newest member of their team. Currently I am living in Panama, another country located in Central America, working to transform communities through educational and health projects. My experience working with the sponsorship team at Save the Children helped me realize that when dynamic, positive, and passionate people get together to change the world, they can do it! Have you had a similar inspirational moment in your life? Think of a time when you worked with a group of committed individuals who were passionate about the project at hand. We would love to hear some of the ways you have seen dedicated work pay off in your community, home, or work environment. Here at Save the Children sponsorship we believe loving what you do is very important! 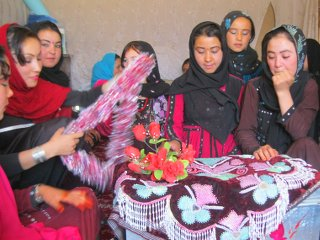 Let us take you to Saripul province, one of the northern provinces of Afghanistan where we are implementing sponsorship funded programs, for a glimpse at a rural Afghan wedding. Typically, the boy’s family together with some relatives will go to the girl’s house to get the formal positive response, which is confirmed by the receipt of a basket of decorated artificial flowers and a tray of candies and chocolates. This arrangement will then be taken to the boy’s house, accompanied by family members playing music and dancing, where more relatives have already gathered to wait for the basket. This becomes the engagement party. After the meal is served the family will continue playing music and dancing. The night before the wedding ceremony there is another party called Henna which is commonly celebrated in the girl’s house or in a hotel. There will be around one hundred relatives and friends of both families. Guests first go to the home of the family that invited them to the party, before all gathering at the girl’s house together. Except for close relatives there will usually be separate halls for men and women to sit, be served their meal, play music, and dance. Henna, dye from the henna plant, is applied to the groom and bride’s palms after the meal. The bride and groom do not see each other at these gatherings prior to the wedding, but are permitted to meet on other days. In rural areas, wedding parties are not celebrated in wedding halls but directly in the bride’s house. The wedding begins with the gathering of a few girls in the groom’s house for some pre-wedding preparations. Girls and women from both families will design and decorate the bride and groom’s room. They prepare silky curtains, bed sheets, and other handicrafts. Usually hundreds of guests are invited to the wedding. 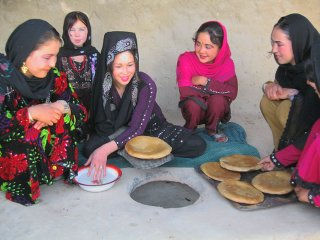 In most cases, men will be invited for lunch and women will be invited to join them in the evening. After dinner, the bride and groom, in their specific wedding attire, will be accompanied by their close relatives and friends to a special decorated camp for all guests to see. The couple’s faces are then covered by a shawl and a family member places a mirror under the shawl, symbolizing the bride and groom seeing each other for the first time through the mirror. Then with help from close friends or relatives, the bride and groom cut the cake. They will hold each others’ hands and give the special sweet water prepared of sugar and water, or juice, to each other to drink. This is followed by hours of celebration with music and dance, only breaking for guests to give gifts to the bride and groom. 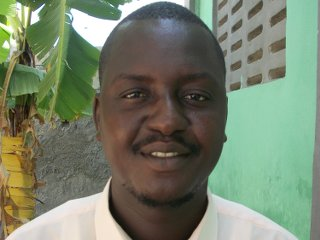 I am a Basic Education Advisor with Save the Children, and I support several countries. I feel very lucky to have this job – you never do the same thing twice and you are always having new experiences and learning. I come to Mali twice a year to help move education work forward, such as in terms of quality and reach. We identify priorities together based on issues they have found in their daily work, new priorities from the Ministry of Education, communities, and children, and new approaches and strategies from other countries or from the international education community. This visit, we are focusing on three things: improving the quality of our community-based reading clubs, using the data we gather on reading to help inform what we do, and identifying ways to make children safer at school. The reading clubs are run by volunteers to give children the chance to practice and reinforce the reading skills taught to them at school. 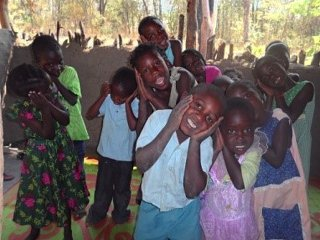 We hope that by making these clubs fun and child-centered, children will also develop a love of reading which will serve them through life. 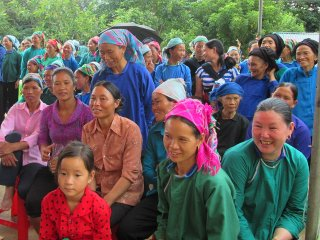 During my visit, we have visited six camps in three sites. Our basic education team in Sikasso chose one site that was good, one that is on the way to being good, and one that really needs help. The one that was good was really very good – the volunteer was friendly, fun, and very engaging with the children. He invited their opinions and respected their ideas. 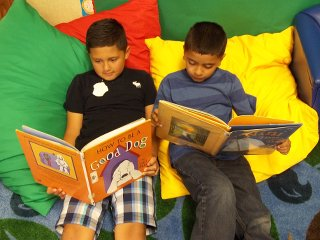 It was obvious the children enjoyed the song, story, discussion, and reading time he led them in. It is important for me to see this, because it means that the team and I have the same idea as to what quality is, and we know what we are trying to achieve. The other visits reminded me how different these ideas can be for our volunteers, who have a very limited, often negative, experience of school themselves. As a team afterwards, we brainstormed ways to continue to help the volunteers through strengthening their skills and confidence. My second objective was to help the team analyze the latest data coming out of our Literacy Project. We saw some exciting trends emerging. For example, children learning in their own language are learning to read faster than those that are taught in French. 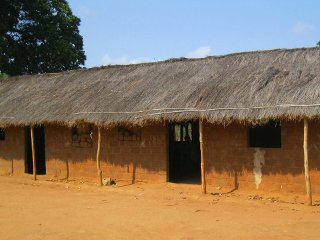 We were also reminded of how inequitable systems can be, as schools with fully trained, motivated teachers that are on the government payroll are doing much better at teaching reading than schools where the teachers are community members, paid irregularly, and teach in remote locations with poor infrastructure. We discussed the implications around these findings, and how we can focus our energies and resources on those most in need. The last objective was to make schools safer for children. We held a cross-sectoral workshop with other teams that work in schools, such as in school health and nutrition, sanitation, and staff from the emergency education project in the north of the country. Participants reflected on their own experiences as children, then on what they see now as professionals. We shared different approaches to keeping children safe, such as teacher training in positive discipline and child rights, school-based codes of conduct, and child governments and mothers’ associations, and discussed best practices within each. Then we identified gaps in our current programming and made a plan for the next 18 months to address the issues. I am now sitting at the airport in Bamako, the capital of Mali, waiting for a delayed flight to Nairobi in Kenya. From there I’ll be going to the Democratic Republic of the Congo for a week to support their efforts to help children learn to read more effectively. I feel my time in Mali was well spent – they are a great team, and I love working with them. I wish I didn’t have to travel all night now, but at least the delayed flight enabled me to write my blog! Jadlin is a third grade teacher at a Save the Children-supported school located in Dessalines, and has worked there for over 5 years. He teaches children between the ages of 8 and 10 and lives very close to the school. Growing up, Jadlin liked to work with his classmates pretending to be a teacher. It is something that he truly enjoys. Before the integration of Save the Children programming, Jadlin admitted he didn’t have sufficient training to manage his classroom or teach certain topics such as geometry or creative writing. The various trainings he has received through Save the Children have brought significant changes to his professional life. According to Jadlin he has learned new teaching methods in disciplinary techniques, how to better manage his class, and how to encourage his pupils’ participation. He now knows it is important to use questioning and group work in the classroom. “I considered myself like I was a dirty dish. Save the Children washes it and fills it up with knowledge.” he added with humility and fulfillment. Jadlin recognizes he is not the only beneficiary of the organization. 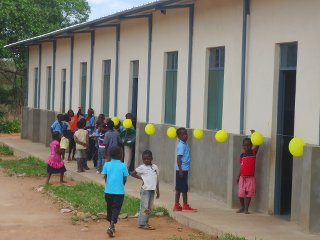 Now with help from Save the Children, the school has at its disposal services such as wastebaskets and a book loan program for third to sixth grade students. Parents also are more aware of the activities in the school and of their children’s education. However, children are still affected by flooding in the community during the rainy season and the shortage of potable water. Jadlin hopes that the organization will not only continue to support teachers training but will help the community solve those problems as well. Jadlin is proud to be a teacher at this Save the Children-supported school, and sends a big thank you to the sponsors for their support of Save the Children sponsorship programs. 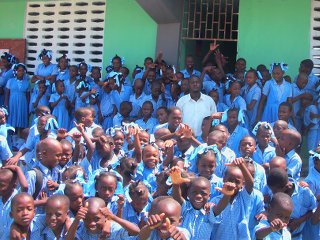 Be on the lookout for updates from Haiti on how Save the Children is helping communities solve other challenges facing children! My name is Florence Chokani and I come from Nembere Village. 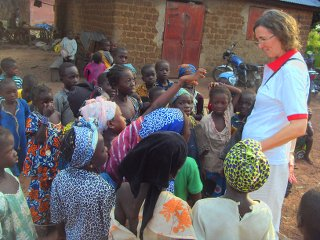 I am a community volunteer who encourages children of my area to go to school. 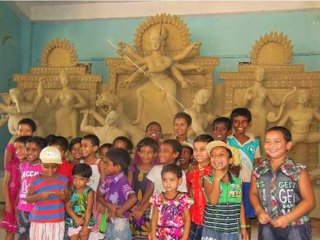 I also teach children in Literacy Boost camps and work as a care giver in a Community-Based Child Care Center. I started volunteer work with Save the Children in 2010, as a camp leader helping children read and write after school. Then in 2011, I joined Early Childhood Care and Development as a caregiver, where I was responsible for teaching children under the age of six. Additionally, my community selected me to be a Sponsorship Agent, after seeing the passion that I have for my community, for which I helped track enrolled children for their eligibility. This year the community has also entrusted me with another responsibility: representing youth in my area as a Youth Community Based Distribution Agent. I started volunteering with Save the Children because I wanted to help children in my community. I would love to see an educated community in the future, which will be a breeding ground for development. My dream has always been to work alongside communities in shaping the lives of children. I have been given that opportunity thanks to Save the Children. I also started volunteering because I wanted to learn new things, for myself as well as for people close to me. For instance, in terms of child development, I have learned how to teach and communicate with children. I have learned how to recognize child problems and abuse and how to counsel children. 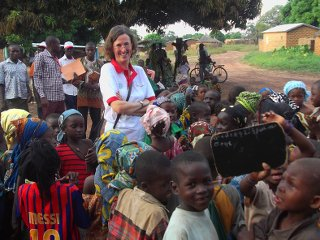 Above all, I have learned and appreciated how Save the Children’s sponsorship program works and impacts the lives of children, which I gladly share with caregivers and parents. Volunteering has some added benefits: it keeps me occupied and the community values me a lot because of the support that I provide. I am content knowing that. However, nothing gets me more excited than the children. Whether out of school or in school, they always run to me because they know my presence. Knowing the impact I have on the children makes me feel special – it makes me proud to be a member of the community.